In the City streets and its “courtyards, there’s a grace and original elegance, and in particular they have their lineal ascendants far away from the decorative Roman-Pugliese tradition, although connecting to Baroque of the Roman kind. One of the most fascinating expressions of this particular taste is the façade of the Church of Santa Croce, masterpiece of Francesco Antonion Zimbalo, together with that of the neighbouring front of the Convent of the Celestines, today’s seat of the Prefecture. Sculpturer-Architect, the Zimbalo, overlaid with genial originality, his plastic, Baroque mantles in an architectural 16th Century structure. 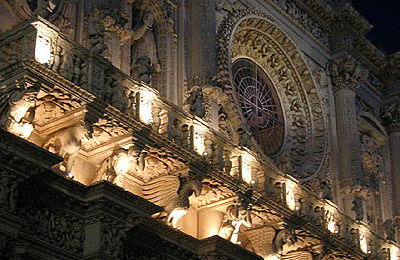 The materials used can safely be attributed to the extraordinary flourishing of the Baroque from Lecce, for example, a sandy, homogenous limestone, with a good golden white colour, known as “pietra leccese,” soft and compact to use. Amongst the buildings that add to the elegance of the Cathedral’s square, other than the Cathedral, the City remembers the Palazzo del Seminario (Seminary) of Giuseppe Cino, one of the works most representative of the final Baroque period and Saint Chiara with its lively façade. 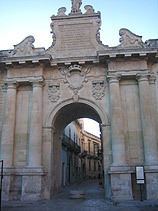 The characteristic architectural language of Lecce, is manifested also in the Churches of the Rosario (Rosary) and Saint Angelo of Giuseppe Zimbalo, nephew of Francesco Antonio, as well as in that of Saint Matthew, with its beautiful concave-convex (the only one following a true Baroque style) and once again in the Palazzi Carafa (Town Hall), Rollo and Giromini. Messapiche and Roman vases have also been preserved in the provincial Museum, Sigismondo Castromediano.